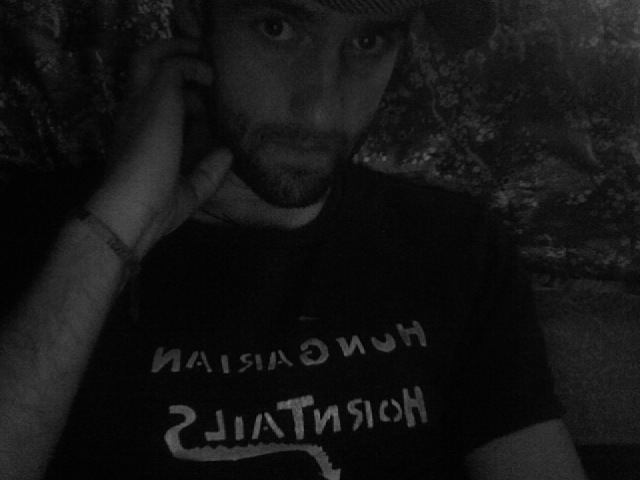 Jason Anderson is a singer-songwriter from central New Hampshire. He’s been touring the country (and some of the world) for a little while now, playing anywhere and everywhere. From parking lots to ice cream parlors, kitchens to campfires, Jason brings his cathartic, anthemic music to audiences large and small and very small. Follow his adventures and, if you like, join along here. What was the process of becoming a musician like for you? An early memory is lip syncing Beach Boys songs with my brother in the living room. Our (very patient) parents were required to purchase tickets for these “performances.” It’s been all downhill from there, as you might imagine. My grandmother taught me the piano when I was in third grade. In eighth grade I switched to the guitar (it seemed so much cooler) and sort of starting writing songs in high school (by “sort of” I mean I wrote one song that was a half-joking tribute to our iconic custodian, Don). I was also in a couple terrible grunge bands. In college I started writing more seriously. I lucked into seeing an early, intimate Elliott Smith gig and immediately started writing songs that pretended to sound like him (they were extremely bad). It’s been a (very) slow process of trying to find my own voice. I do love it, though. I love nothing more. I think life itself is a process of (gradual) growth and change, shedding skins and moving forward; my “artistic” aspirations have followed suit. All sorts of things. Travel. My family, my friends. Sincerity. Passion. Lately I’ve been really into the music of Ximena Sarinana and Esperanza Spalding, and the books of Toni Morrison. Beat Happening is one of my favorite bands. What was it like meeting Calvin Johnson? Growing up in rural New Hampshire I was not exposed to a ton of underground music. I did know that Kurt Cobain had one tattoo and that it was the K Records logo. I met Calvin through mutual friends. He was always friendly and enthusiastic. Over the years we’ve been able to record and tour together with a couple different projects. One of my favorites was getting to be a part of Sons of the Soil, which toured on Calvin’s back catalog, re-imagining Beat Happening and Halo Benders material. What was the transition like for you artistically from Wolf Colonel to your solo work? Your songs (e.g., “Our Winter”, “El Paso”) often convey a strong sense of place and time. How does these factors affect your work? I love touring and am often on the road, playing shows. I feel lucky to get to travel so much. For me, as fun and magical as the concerts are, they are such a small part of the experience. The adventure, really, is that of-the-moment spontaneity, the wandering, the exploring. On my tour last fall, for example, I wanted to make sure that every day was special, containing something adventurous or new. I wanted it to feel as much like vacation as it felt like “tour” (and, really, can’t the two collude? ); it was so fun poring over the atlas on a daily basis and deciding what to do with my time. Whether it was driving the back roads of Ohio, having my mind blown at the red rock of Moab, camping in Yellowstone, wandering the Hoh rain forest in Washington, watching elk at Rocky Mountain National Park, mountain biking the rim of the Grand Canyon, or hiking in White Sands, NM (but a few highlights), I did my best to really (try to) live each day. Perhaps unsurprisingly, a lot of those experiences and observations make their way into my songwriting. Your recent show with friends in Portsmouth, NH was powerfully interactive with the fans in attendance. How do you view the relationship between the artist and the audience? You have collaborated with some great female musicians such as Rachel Jensen, Mirah, and Leigh Jones. From your perspective, what is the role of gender within folk/singer-songwriter traditions? How are female musicians treated by the press compared to men? I am definitely not a cultural historian but I suppose you don’t have to be to grasp that (like many other enterprises) the music scene is and has been dominated by men. At the same time, it’s awesome that folk artists like Joni Mitchell, Lucinda Williams (another one of my favorites), Tracy Chapman (she’s so good), and the aforementioned Gillian Welch (to name just a few powerful, brilliant women who immediately come to mind) are respected and revered for the talents and visionaries that they are. I often wonder if, within the folk/singer-songwriter scene, specifically, women are taught or encouraged to be demure, precious, coy. It’s so awesome and refreshing and necessary to see artists and female-fronted acts like Cat Power, Yeah Yeah Yeahs, Adele, Alabama Shakes, Waxahatchee, Mount Moriah, and tUnE yArDs (again, to name but a few) subvert that stylistic paradigm and garner some serious attention, respect, and critical claim all on their own terms and with their own unique, wild style. Well, first I should acknowledge that I am a man and that my relationship to feminism will be inherently different than a woman’s relationship to it. Probably my most direct work at the interactions of art and feminism came when I was teaching music in New York City. As a teacher, I was always trying to push my students to stretch the narrative of what they thought they could do or be. Here is one example. When a female student (she took guitar lessons with me for four years, from her fifth grade year to her eighth grade year) showed an interest in songwriting and performing, I did everything I could to encourage and nurture her. I helped her record her original songs on my computer and booked her two performances at the Sidewalk Cafe (the legendary East Village venue where two other great, unique female songwriters, Kimya Dawson and Regina Spektor, got their start). This might seem like a small thing, and maybe it is, but I fear that young women are not always or often encouraged to join bands or write songs or play gigs (or even play the guitar) the way that boys are. That’s why projects like Girls Rock Camp are so vital and exciting; they challenge and subvert the story that rock and roll is a male-only zone. At any rate, the second concert I booked for this student took place on her thirteenth birthday. To see this amazing, talented, powerful young woman rocking the stage–performing her own songs, playing the guitar, bantering with the crowd, hassling the soundman, getting paid at the end of the evening–to a packed house of friends, family, strangers, brought tears to my eyes. I was so proud of her and excited for her. I think the more subtle, day-to-day work (if you can call it that) is just that of a dude (me) trying to exist and act, as a musician, sensitively and supportively (vis a vis women) in a male-centric society. So whether that’s booking shows and tours with other female artists, or asking women to collaborate with me musically, or simply championing the artistic work of women (I can’t tell you how many people I’ve urged to read my favorite novelist Louise Erdrich), it is important to me to acknowledge and celebrate the many talents and inspiring output of my sisters. There’s more I could do, and I would never claim to be a perfect, completely enlightened feminist. And, again, I want to stress that while I consider myself as such, or coming from a feminist-informed point of view, as a man it will be a different lens for me. The term “folk music” conjures many images and stereotypes, and has been a label applied to a diverse group of artists, from Odetta to Beck. What does “folk music” mean to you? That’s a great question. You’re absolutely right, it can seem to mean so many things. I suppose (if I’m limiting this discussion of “folk” to, say, the post-Woody Guthrie, popular folk revival scene) there is the (superficial?) “genre” connotation of acoustic guitars, banjos, “work songs,” etc. When I really think about it, though, when I think about “folk music,” I simply think about music that brings people together. I guess I can bounce part of this answer back up to your question about audience participation and performer-crowd interaction. 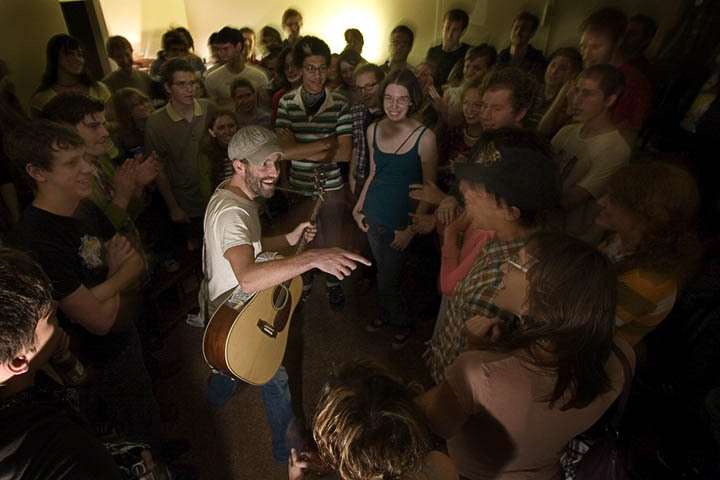 I am sort of in love with the idea of people getting together (in living rooms, basements, on the street, in that old barn in Portsmouth, for example) to connect through song; to sing and dance and sweat together. To live together, to be together, even if it’s just for a couple hours. There’s something that feels right in that, to me, anyway. I think that’s what folk music is to me. That’s my folk music. Music that dispenses with hierarchies and invites one and all to leave their troubles at the door; or, perhaps, sometimes, most importantly, to exorcise those woes through the shared catharsis of group song. Or something like that. Should I simply say “James Taylor” and be done with it? Kidding. On what projects are you currently working? I am always writing new songs. I’m hoping to record a new album soon and will be touring for most of the rest of the year. I hope to keep improving as a writer and performer, continuing to hone what I want to communicate, and how I want to communicate it. I recently saw the author Junot Diaz speak, and he talked about (what he called) the professionalization of art. He referred to this idea of art as commerce, of art as a career goal; he talked about students of his who often ask, “How do I become a famous writer?” and spoke to the fact that, growing up, he himself never had the impression that his writing would make him money. There was a similar sentiment expressed in a piece on Louis CK that I read in the New York Times (CK referred to the sense of entitlement many young artists feel; that attention should be instant and easy. I would add to that the idea that maybe people feel that way because perhaps in these times of Youtube and blog hype and “what’s the next (immediate) big thing” waning attention spans it can and has work(ed) that way.) But, generally, speaking, I totally agree with these positions. I think that whatever you do, it has to come from a place of love. If you love what you’re doing–in this case making music–if you are just as excited writing songs and playing guitar alone, in your bedroom, as you are in front of other people, then everything will generally be OK. And you cannot expect anything else, really. I’ve given up trying to predict who will “make it,” how, and when. (And of course, be constantly calibrating and grappling with your own personal definition of success.) If anything else does come (money, larger audiences, critical acclaim or disdain), navigate those waters. But every step of the way, have fun, be fair to others, and hold on to to that feeling, the pure one, the one you get when you’re alone in your car and that one song comes on and you turn it up as loud as it will go and you sing along to every word. That’s the feeling I’m always chasing, anyway. ← Author interview: Tommy “Teebs” Pico !